ABSTRACT: In the last three decades a collection of linear supply chains has become a complex adaptive network of demand creating supply. The benefits are obvious. The risks tend to be insidious. With the 2012 National Strategy for Global Supply Chain Security and the 2013 Implementation Update on the strategy, a public-private process has been engaged for considering risks and cultivating resilience. Complex adaptive systems are not well suited to traditional security mindsets. In the natural environment resilience emerges from diversity, self-organization, and innovation. Are these characteristics appropriate to the supply chain? Can these characteristics be systematically cultivated by private and public decision-makers who influence the supply chain? This essay points to prior examples of dealing with complex adaptive systems to suggest an affirmative conclusion. Supply has been unchained. Improvements in transportation – highways, fast high capacity planes, intermodal trains, trucks, and ships – combined with a revolution in computing and communications have transformed a dense lattice of overlapping chains of supply into a shared network for delivery-on-demand. Only thirty years ago a major retailer often owned most of the links in a chain that connected producer to consumer. No more. Almost everyone specializes in a horizontal or oblique or nodal niche. Each niche forms around functional expertise and comparative advantage. This global commons makes possible more goods at lower cost and with better assurance of quality than ever before. In the last generation we have experienced a rate of change and improvement in moving goods not equaled since steam-power transformed maritime shipping and made possible railroads. On June 26, 1974, at a Marsh supermarket in Ohio, a pack of Wrigley’s Juicy Fruit chewing gum became the first retail product sold using a scanner and Universal Product Code. The use of the UPC and other “bar codes” allows the supply chain to be digitally monitored, mapped, and managed as never before. Logistics has become one aspect of a constantly shifting supply and demand stream. Increasingly these processes – and the rich information and management resources they make possible – ensure effective, timely, and comparatively friction-free transactions between companies and nations. The ability to share digital information in very close to real-time has transformed the modern supply chain from supply-push to demand-pull. Farmers, miners, and fishermen still matter. Processors, truckers, wholesalers, and retailers still play crucial parts. Ports, railways, and highways are still required. Physical stuff of all sorts still has to move from point A to B (and usually on to points C, D, and Z). But at least in the United States, Europe, and Pacific Rim, the digital signals that are sent along largely determine when and where product arrives. When the strategic capacity for generating demand-pull information persists, the supply chain is very resilient. But disruption or corruption of this information stream also presents unprecedented challenges to supply, especially in crisis situations. In the aftermath of the March 11, 2011 earthquake-and-tsunami in Japan demand signals went dark across the hardest hit areas of Northeast Japan. At the same time, demand spiked in Tokyo and other areas far from the impact zone. The supply chain responded adroitly to hoarding behavior by those whose demand could be communicated with a quick electronic scan. But this same behavior reduced the capability of Japanese producers and distributors to respond to the critical needs of those who had been rendered digitally mute. 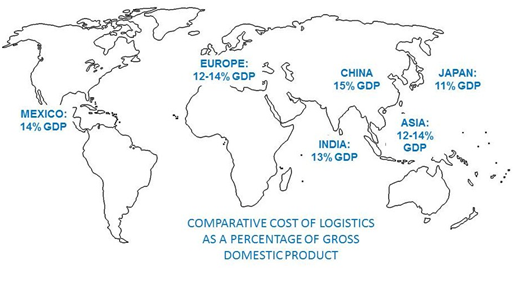 As late as 1980 the cost of logistics as a proportion of GDP was more than double what it is today. Over the last three decades logistics has become something very different than ever before. For most of human history anticipating demand has been a guess. In a few cases, historical data might be used to project demand and some using it were better – or luckier – guessers than others. But mostly demand was met (or not) by producing and distributing what could be supplied at a price the producer hoped the market would pay. A nineteenth century economic doctrine, as stated by John Maynard Keynes, was “Supply creates its own demand.” Certainly true until the 1980s was supply creates its own distribution – in search of demand. The competitive success of Toyota and other Japanese firms in the 1970s and ‘80s converted many US and other manufacturers to similar philosophies and practices. In 1983, Zero Inventories by Robert Hall articulated the ultimate goal and a workable process for achieving the goal. It was a process aided and abetted by the increasing ability of computer databases to store and analyze customer data. In 1972 Walmart had fifty-one stores. By 1980 it had grown to 276 stores. In 1983 Walmart replaced all of its cash registers with computerized point-of-sale systems. In 1987 Walmart installed the largest privately owned satellite system in the United States to facilitate the increasing amount of demand and sales data being generated. In 1990 Walmart overtook Sears to become the nation’s largest retailer. In 1993, with nearly 2,000 stores, Walmart achieved its first billion dollar sales week. Today Walmart has nearly 10,000 stores and generates annual sales of over $422 billion. In terms of operating revenue it is the world’s largest private enterprise. Technology plays a key role in Walmart’s supply chain, serving as the foundation of their supply chain. Walmart has the largest information technology infrastructure of any private company in the world. Its state-of-the-art technology and network design allow Walmart to accurately forecast demand, track and predict inventory levels, create highly efficient transportation routes, and manage customer relationships and service response logistics. Unisys, of New Jersey, cut its supplier base from 750 to 106 and reduced the number of trucking companies from 120 to 8. 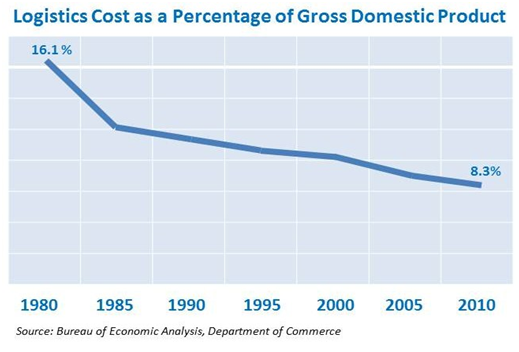 As a result, purchase costs have dropped by 40 percent, freight costs have been reduced from $.32 per pound to $.09 per pound, and transit times from the Far East have been cut by two-thirds. Success stories like this, and increased competition by early-moving innovators, transformed many product categories from supply-push to demand-pull. In 2000, the Department of Defense opened the Global Positioning System (GPS) to public use. This transformed the potential of trucks, in particular, to respond to irregular demand as effectively as was once only possible for most favored customers. Demand increasingly determined supply. In a period of barely three decades, technological innovations have radically transformed 5000 years of transportation history. The results have also included increasing concentration, greater interdependence, and lower profit margins (even as gross profits have increased due to much higher volume). The supply chain at large – and individual supply chains – increasingly involves a complex set of inputs, outputs, and multi-layered relationships. And as with other complex entities, the supply chain can sometimes seem, (perhaps more than seem) to take on a life of its own. Complex systems evolve discontinuously through space and time… Such systems appear to have no memory; that is the past is not a prelude to the future. Instead the future of a complex system is highly irregular and unpredictable… Systems become more complex as they are improved; as they are made more efficient, less expensive, and more capable. They also become more self-organized. Therefore the more we improve these systems, the more likely they are to collapse unexpectedly. This is our reality. A pioneering generation of supply chain innovators has succeeded in a historic transition of their field. A rising generation takes the revolution for granted and can barely imagine the pre-revolutionary reality. The successors are naturally inclined to perceive the progress of the last thirty years as predicting the next thirty years. This is not guaranteed. Given persistent patterns of self-organized criticality found in other complex systems, supply chain problems – even potentially catastrophic problems – are very likely to emerge. Before the technological revolution of the last thirty years the supply chain featured much more redundancy, safety inventory, and many more independent players than today. It was less complex, more resilient, more costly, and much less efficient. Resilience is an innate tendency, usually consisting of several inter-related parts, that allows a system to flex under stress and bounce-back to something similar to its preexisting condition once the stress is lessened or removed. Complex systems are not inherently less resilient than non-complex systems. But the resilient characteristics of complex systems usually emerge from recurring experience with cascading – occasionally catastrophic – failures. Failure re-opens a complex system to innovation, adaptation, and further optimization. Can we cultivate a resilient supply chain that avoids – or at least mitigates – catastrophic failure? The contemporary supply chain continues to self-organize and optimize so rapidly that it is difficult to make any certain claims regarding its innate resilience or non-resilience. But there have been examples – most dramatically after the 2011 Japan earthquake-and-tsunami – that suggest the global supply chain behaves in a manner analogous to other complex systems. Adaptability (even improvisational and opportunistic). These three characteristics are closely related, especially in terms of the resilient behavior they support. Diversity is an effective defense. The functional diversity of a system increases the chance for diversity of response under stress. If even a few individuals or sub-groups can effectively adapt to the stress, the entire system is more likely to be preserved and have a chance for recovery. The contemporary supply chain has seen a proliferation of niche players, each with very specific functions that contribute to the supply chain’s overall health. While there are fewer competitors in any particular niche (less structural redundancy) there has been a significant increase in niches (more functional diversity). This functional diversity is a potentially important source of resilience. Complex systems are innately self-organizing. Feedback mechanisms across a system facilitate the emergence of global patterns from numerous random interactions among widely distributed components. No one controls global effects. The global effects are spawned by spontaneous behaviors that nonetheless produce patterns and rough boundaries that can be predicted. Especially in human-related complex systems, dynamic communications among the participants produce shared behaviors to which the system is attracted and around which system equilibrium unfolds. Over the last thirty years, as information has begun to drive the supply chain as much as production or transportation, the supply chain has become more and more self-organizing. Randomly distributed demand information determines what patterns will emerge in the global supply chain. While supply capacity has become more concentrated in fewer players and places, the number of demand signals has exploded and the number of distribution players remains highly decentralized. In 1988 Walmart opened its first grocery-embedded “Supercenter.” There are now over 3,200 Walmart locations offering a full line of food and related products. This has transformed the grocery industry and caused particular stress for traditional supermarkets, such as Kroger, Safeway, and Supervalu. But… the first Whole Foods Market opened in 1980 and in 1988 Whole Foods began sustained expansion at the same time that Walmart was devouring large segments of the grocery market. Whole Foods now has over 300 locations and generates over $9 billion in annual revenue. In the 1980s the McLane Company grew from a modest regional distributor to a major national provider of food and other products especially to convenience stores and restaurants. In 1990 McLane was purchased by Walmart. But it was not a good strategic fit and in 2003 McLane was sold to Berkshire-Hathaway and reemerged as a largely independent enterprise. It now generates over $34 billion in annual revenue distributing food mostly to non-grocery stores, the most rapidly expanding segment of the grocery industry. Walmart is certainly the “apex predator” in the ecology of groceries. But its disruptive behavior has opened new niches for other players. Under stress, the decentralized, self-organizing character of the US grocery market has arguably produced greater differentiation and functional diversity. This is a resilient response. Resilience can mitigate the negative consequences of change through adaptation. Resilience expects change and spawns structural and behavioral characteristics that accept considerable change as a way of avoiding catastrophic change. Diversity does not ensure successful adaptation. A decentralized and self-organizing system produces many mal-adaptive features. But the more diverse and self-organizing the system the more likely the system will generate – nurture and facilitate – effective adaptation. In the 1970s FedEx emerged from a deregulating transportation sector to challenge many long-time participants in the airfreight business. In just a few years the veterans experienced a catastrophe. But from the perspective of the full eco-system – the US economy and eventually the global economy – FedEx was a positive adaptation to changing conditions. The emergence of FedEx, and other supply chain “species” descended from the FedEx adaptation, strengthened the US supply chain and national economy especially by increasing diversity and self-organization across the supply chain. Diversity and self-organization are inputs that increase the likelihood of positive adaptation. Effective adaptation to change – while conserving and strengthening most attributes of the system – is the benefit of resilience. But if adaptation reduces diversity and self-organization the adaptation is non-resilient and moves the system closer to cascading catastrophe. For the first time in the history of the 10-year-old study that looks at the relationship between automakers and their suppliers, a U.S. automaker – Ford – ranked in the top three. It was third, with Honda and Toyota in 1st and 2nd place, respectively. The change in Ford’s behavior has several origins and reflects a broader trend. In the 1980s, when JIT was initially adopted by many US firms, there was much more attention to quantitative outcomes – such as a steep reduction in number of suppliers – than to qualitative inputs, such as the relationships between buyer and supplier. Yet the Japanese practice of JIT emerged from and depended on very dense relationships. A Japanese Keiretsu – literally “headless combine” – is a grouping of firms that collaborate in design, sourcing, production, and distribution. They are often linked through mutual ownership, joint planning, and a vast web of informal connections. The structural aspects of keiretsu have been long recognized by emulators in the United States, but the cultural dynamics of these relationships were not well understood and tended to be undervalued. … the “exit” vs. “voice” distinction is no longer as clear as it was just twenty years ago. On the “voice” side, the closed keiretsu system of suppliers characteristic of Japanese industry has been considerably opened to market pressures, requiring more formalization and cost justification of the relationships. On the other, the hard-nosed “exit” approach of U.S. firms has faced pressure for increased collaboration to achieve the increased levels of quality demanded in the market. There has been a wide range of responses to these pressures, often mixed and contradictory. In the U.S. there are frequent attempts to achieve the necessary levels of collaboration without trust; but this approach is marked by internal contradictions which, we believe, make it unlikely that it can stabilize as a lasting model. Thus, we will argue, the industry is converging from all sides on a form of pragmatic collaboration, involving substantial levels of trust, though more open and formalized than the traditional Japanese system. This convergence could enhance diversity and self-organization across supply chains. The classic Japanese model nurtured diversity but suppressed self-organization. The US approach to implementing JIT has too often ended up with carefully controlled – and risk-increasing – sole sources of supply. While far from reflecting mainstream current practice, there is an increasing realization that trusted relationships – both tactical and strategic – are essential aspects of an effective and resilient supply chain. Trusted relationships optimize diversity and self-organization. What are your key types of suppliers, partners, and collaborators? What role do these suppliers, partners, and collaborators play in the production and delivery of your key products and customer support services? What are your key mechanisms for communicating with suppliers, partners, and collaborators? What role, if any, do these organizations play in implementing innovations in your organization? What are your key supply-chain requirements? Today it is difficult for many supply chain participants to answer these questions. But there is a growing consensus that these are important practical questions. Being able to honestly respond to these questions with answers that are strategically predisposed to diversity and self-organization makes catastrophic failure less likely. On January 23, 2012 the president of the United States released a first-time National Strategy for Global Supply Chain Security. This initiated a yearlong process of private-public consultations. From these discussions a troublesome pattern has been identified: For most of the last generation the private sector search for comparative advantage has resulted in a substantial decrease in the supply chain’s structural diversity. Fewer firms play increasingly important roles. The decline of structural diversity in the supply chain is a potentially significant problem that amplifies every threat by reducing the likelihood of innovative responses to stress. But an increase in traditional modes of regulation will – whatever the effect on diversity – reduce the ability of the system to self-organize, undermining the likelihood of innovation under stress or otherwise. This private-public tug of war threatens to wring out of the system two key components of resilience. This is the kind of optimizing that contributes to eventual catastrophic failure. This is no longer a supply chain that can be yanked one way or another. It is much more a spider-web, even more an ecosystem where what is done in one corner will often have dramatic and unpredictable impacts across the entire system. Preserving a system’s ability to innovate is fundamental to preserving the system’s overall integrity. Failures will happen. Innovating around failure is how a complex adaptive system continues to emerge. But long-term health is determined by the sort of innovations and adaptations adopted. When diversity and self-organization are maximized, resilience is nurtured. When diversity and self-organization are reduced the next failure is likely to be even worse. Bureaucracies, both public and private, tend to be suspicious of innovation. There is an inclination to respond to problems with predictable procedures. As procedures accumulate, small failures are suppressed and, in many complex adaptive systems, the likelihood of catastrophic failure is increased. It doesn’t matter if the procedural suppression of innovation is imposed by government regulation or internal management, non-resilience is the outcome. The Implementation Update for the National Strategy for Global Supply Chain Security (February 2013) signals a continuing coordination role by White House National Security staff and a private-public supply chain working group staffed and hosted by one of the cabinet departments. This could be helpful. It might be a waste of time. Over time it could become dangerous. Much depends on behavior and that is a reflection of who and how and why. The presumption when private and public meet is – whatever the stated purpose – the eventual agenda relates to rule making and boundary setting by the government. As such, the process is subversive to diversity, self-organization, innovation, and resilience. “Evidence has accumulated that externally imposed rules tend to “crowd out” endogenous cooperative behavior.” Stakeholder cooperation in setting norms is especially important in dynamic systems such as the supply chain. In complex adaptive systems rules and boundaries quickly lose influence without active self-monitoring and sanctioning by those involved day-in and day-out, even minute-by-minute, within the system. Some studies have found that externally focused regulation can even “undermine subsequent cooperation” in developing norms. Put another way: When dealing with a complex adaptive system rule breaking can be sanctioned after the fact by external rule-makers. But if prevention of rule breaking is the goal the rules must be developed and enforced by system participants. The global supply chain has become a complex adaptive system. As with most complex adaptive systems – and especially human-influenced systems – it is self-optimizing. If and when optimization reduces diversity and self-organization the possibility of catastrophic failure increases. Most evidence suggests this is the current trend-line for the global supply chain. Government action focusing on traditional approaches to regulation would accelerate the movement toward catastrophe. But there is another option. Social manifestations of complex adaptive systems can be influenced by intentional social behavior. Precisely because government is not engaged as a competitor or vendor in the supply chain (and is an important customer), the government could serve as a facilitator or honest broker of boundary-setting, rule-making, and system sanctioning by supply chain stakeholders themselves. The Cross-Sector Supply Chain Working Group called for in the White House Implementation Plan could become neutral ground for ongoing communication among supply chain stakeholders. The National Security staff official(s) assigned to coordinate this process would certainly not be any kind of White House Czar. In most ways s/he would need to be an anti-Czar, a latter-day Metternich composing and facilitating a supply chain world symphony with as much skill as the old Count conducted the Concert of Europe. This is unlikely. Count Metternich was unique and the complexity of Post-Napoleonic Europe pales in comparison with the modern supply chain. Catastrophe is much more likely and from the collapse of market-leaders, nation-states, and legacy systems something better may emerge. This is the role of catastrophe. If supply chain catastrophe is to be avoided or mitigated diversity and self-organization must be optimized. This combination – diversity, self-organization, leading to innovation and adaptation – is the strange attractor at the heart of the supply chain’s revolutionary transformation. The deeper the system’s diversity and the more inclusive its self-organization the greater the system’s resilience. Can the anti-Czar remember this? Can a private-public panel behave consistently with this purpose and direction? Can a complex adaptive system fail and innovate and fail some more, skating along the cusp of catastrophe but always sliding back into the deep basin of diversity, self-organization, and innovation? Back to Metternich: In his early text, A World Restored, a young Henry Kissinger explains how the Austrian Count and others crafted the Concert of Europe. …the spirit of policy and that of bureaucracy are diametrically opposed. The essence of policy is its contingency; its success depends on the correctness of an estimate which is in part conjectural. The essence of bureaucracy is its quest for safety; its success is calculability. Profound policy thrives on perpetual creation, on a constant redefinition of goals. Good administration thrives on routine, the definition of relationships which can survive mediocrity. Policy involves an adjustment of risks; administration an avoidance of deviation. Policy justifies itself by the relationship of its measures and its sense of proportion; administration by the rationality of each action in terms of a given goal. If supply chain resilience is to be achieved it must remain a matter of policy rather than administration. Supply chain resilience will not be achieved bureaucratically, but it can be crafted through the intelligent self-conscious give-and-take of authentic private-public collaboration in policy-making. Bureaucratic behavior – whether it originates in corporate or government offices – threatens the supply chain. Non-bureaucratic policy makers who persistently nourish diversity, self-organization, and innovation will enable the modern supply chain – and all its benefits – to flourish. Philip J. Palin is the principal author of the Catastrophe Preparation and Prevention series from McGraw-Hill. Other publications include Consequence Management (2008), Threat, Vulnerability, Consequence, Risk (2009), and Supply Chain Resilience: The Strategic Playbook (2012). Mr. Palin chaired the General Preparedness Working Group of the Obama presidential campaign’s Homeland Security Advisory Council. More recently he served as project manager for supply chain resilience in the Mid-Atlantic Regional Catastrophic Preparedness Grant Program. He is a former college president, foundation executive, and corporate chief executive officer. Mr. Palin can be contacted at philipjpalin@gmail.com. Andrew Gilligan, “Japan Earthquake: Calm after the Storm,” The Daily Telegraph (London), March 20, 2011, http://www”.telegraph.co.uk/news/worldnews/asia/japan/8393056/Japan-earthquake-calm-after-the-storm.html. Eugene P. Seskin and Alyssa E. Holdren, “Annual Revision of the National Income and Products Accounts. Annual Estimates for 2009-2011. Quarterly Estimates for 2009:1-2012:1” (Bureau of Economic Analysis, August 20122012), http://www.bea.gov/scb/pdf/2012/08%20August/0812­_anuual_nipa_article.pdf. John Maynard Keynes, General Theory of Employment, Interest, and Money, Chapter 2 (CreateSpace Independent Publishing Platform, November 15, 2011), 18. Jeffrey Liker, The Toyota Way: Management Principles and Fieldbook (McGraw-Hill, 2011),104. “Walmart’s Keys to Successful Supply Chain Management,” University of San Francisco Online (n.d.), http://www.usanfranonline.com/wal-mart-successful-supply-chain-management/. Richard Schonberger, “The Skinny on Lean Management,” Superfactory (2009), http://www.superfactory.com/articles/featured/2009/0901-schonberger-skinny-lean-management.html. John E. Schorr, Purchasing in the 21st Century (Oliver Wight Publishing, 1992), 98. Ted G. Lewis, Bak’s Sand Pile: Strategies for Catastrophic World (Agile Press, 2012), 341-342. North American OEM-Supplier Working Relations Study (Planning Perspectives, 2010). J.P. MacDuffie and Susan Helper, “Collaboration in Supply Chains: With and Without Trust, The Firm as Collaborative Community” (June 14, 2005), http://www.global-production.com/scoreboard/resources/macduffie_2005_collaboration-in-supply-chains.pdf. Elinor Ostom, “Collective Action and the Evolution of Social Norms,” Journal of Economic Perspectives 14, no. 3 (Summer 2000): 147. Norman Frohlich and Joe A. Oppenheimer, “Ethical Problem when Moving to Markets: Gaining Efficiency While Keeping an Eye on Distributive Justice,” in Erdener Kaynak, ed., Privatization and Entrepreneurship: The Managerial Challenge in Central and Eastern Europe, Haworth Press Series (New York: International Business Press, 1996), 180. Henry Kissinger, A World Restored: Metternich, Castlereagh and the Problems of Peace, 1812-22 (1954), 326. This article was originally published at the URLs https://www.hsaj.org/?article=9.1.14 and https://www.hsaj.org/?fullarticle=9.1.14.